The VBS Budget Worksheet below is free to download, modify and print for your Vacation Bible School. The worksheet is a great tool when your church only has a limited and budgeted amount for Vacation Bible School. This VBS worksheet will track your total VBS budget amount along with all the VBS expenses and then let you know when your expenses has went over your budgeted amount of money. The VBS worksheet is in PDF format below, but if you would like it in the Microsoft Office Excel format (automatically calculates totals) simply purchase the Church Forms CD (all forms on FreeChurchForms.com in PDF and Word or Excel format) and this worksheet for your VBS budget will be included in both PDF and MS Excel format. How Do You Budget for Vacation Bible School? Some churches are able to budget thousands of dollars for their Vacation Bible School, and then some smaller churches can just barely budget a few hundred dollars to find the resources to support their Vacation Bible School. Community Vacation Bible School - Partner VBS with another church or even several churches to save VBS money. There are definitely some negatives with this as far as safety and specific evangelistic outreach, but with great planning these issues can be overcome. It takes a good director who knows how to work with a team to pull this off. Re-Use VBS Curriculum from Another Church - If you don't like the idea above then you could simply ask a church if you could re-use their curriculum after their VBS is over. If you know a church who has their Vacation Bible School in June, then simply have yours in July after they're through with their materials. If you have time you could even volunteer to help at their VBS to see hands on how the program works and would be a way to thank them for the materials. Many churches pass on their VBS props and curriculum every year and they feel great knowing they have helped other churches and children who are not so fortunate. Plan Easy Crafts - You can save money by keeping crafts to a minimal. You're not cheap by planning easier crafts. Aside from the curriculum the craft supplies is a major expense. Don't be too cheap but skip some those expensive craft kits that can be just as good as the cheaper ones. 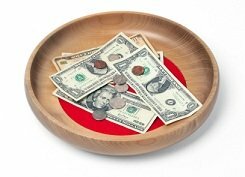 Volunteers/Church Members VBS Donations - In some cases, you might not have to budget for snacks, etc. You can ask volunteers and church members to donate paper goods,cookies, snacks, drinks, etc. Children love their snacks during VBS, but they are happy with simple and inexpensive snacks. Request More Budget Next Year- It's probably too late this year, but next year why not ask for a budget increase. Even if you're a smaller church your members should see the need for the outreach and Vacation Bible School ministry. Use the worksheet below and draft a budget for next year for your Pastor and Board to review immediately after VBS while it's still fresh on your mind and theirs. If you get them to agree to more money then this will simplify your next year's budget tremendously. Return to VBS Ideas from VBS Budget Worksheet.